them into the card design itself? Lisa Johnson tried her hand at printing her photo directly on our Shimmer White cardstock, which gave her fabulous results. I am really looking forward to trying this out myself! Lauren Meader incorporated a keepsake calender into her project. It is such a nice idea to provide suc a wonderful way for the photo to be displayed & enjoyed all year long! Heather Nichols played up the trendy office supply look by designing a special envelope for the cover of her card, which enclosed her adorable family photo. Debbie Olson utilized a fun interactive card design that doubles as a method of displaying the photo as if it were in a frame of some sort. The transition from a flat piece of paper to a #D object ought to keep the recipient on their toes too! Michelle Wooderson shows you an amaing space saver by creating a pivoting tag combo for her card. One little brad does the job perfectly! 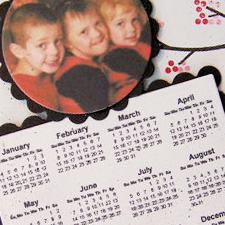 Becky Oehlers used the Basic Grey magnetic closures to turn her photo into a special keepsake.There will be no need for this photo to be tossed away! I can't think of any way to possibly be more inspired to get a headstart on holiday cards than the amazing projects the design team has shared with you today. 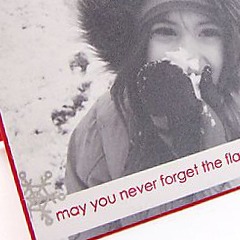 An idea and a little organization will help you on your way to getting those holiday cards done, and early as well! Thank you, thank you, thank you!!! We always include a photo in our Christmas cards. I needed a push and lots of inspiration to get started. I love everyone of these ideas. You have the BEST design team! Hi! Just wanted to take a minute and tell you how pleased I am with with my Papertrey stamps. This was my first time using them and I love them. Thansk so much for the wonderful products and inspiration! Hi, Nichole – just wanted to say thanks for a site that is tops for ideas and inspiration! You can’t imagine how many times I’ve “gone to the well” with your gift idea for personalized labels on Hershey’s Nuggets! I love the Papertrey Products, but your projects are always compatible with what I have on hand. Wow, such talent in the Design Team! Nichole, it takes one talent to recognize another and your stimulate the best in all of us! 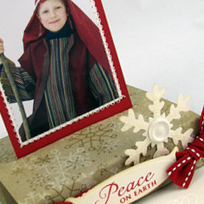 It is time to begin Christmas cards…it is hard to decide with so many fresh ideas here. All of these projects are just fabulous!